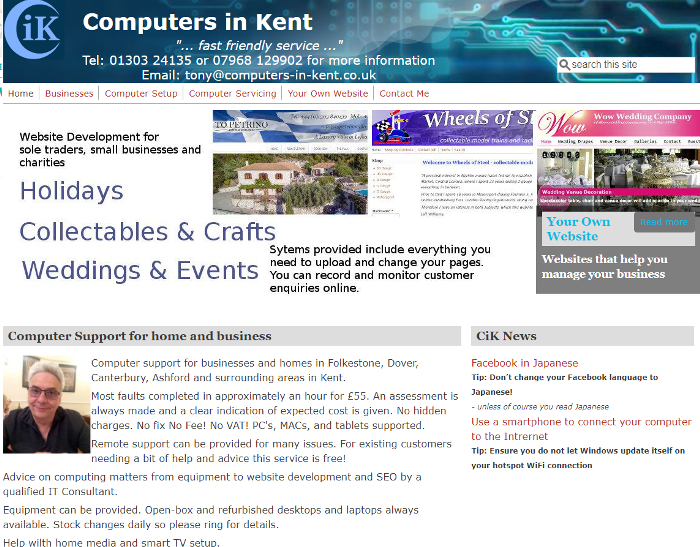 computer support for businesses and homes in Folkestone, Dover, Canterbury, Ashford and surrounding areas in Kent. This can be simple fixes or complete web site development and ongoing computer support. Advice on computing matters from equipment to website development and SEO is also provided. This site like all my sites is a CMS website. These Content Managment Sites can be managed by yourself after completion if you want to. These websites may included the ability to sell products and just about anything else! If you have a business idea then please ring me for a discussion - the advice is free! The site you are using makes extensive use of SQL database views (small programs) to extract summaries of new pages to display on the home page and throughout the site. This ensures that recently added content is promoted to the front page. These views can handle fairly complex selections and are used on this site in the "CiK News" and "Example Websites" sections on the home page. The page urls are also automatically generated and can be changed quite easily to help in SEO work as needed. The moving highlighted image at the top of several pages can be tailored to each page or each group of pages. These features are available to every website I produce. Database view technology allows me to select information from my site and display it on selected pages in different formats. I use this for the testimonials and the website examples. The website examples are simply created once and then the system automatically extracts smaller images to display in the panels on the SEO and Your Own Website Pages. It also formats the Example Websites panels on the home page. There is a management section for any “contact me” emails sent via the website. So even if I lose an email the enquiry remains on site for me to annotate and process. A page design management section allows me to set up the layout of pages. This can be a different layout for every page if needed! I use a special layout for the home page and contact me pages. Special Highlighted images can be set up and told which page or pages to display on. 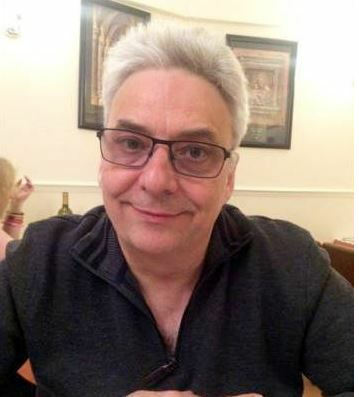 These are the images that change towards the top of the page on the computers-in-kent website. Each image can have its own title, subtitle and link. The link can be to other pages on the website or even other websites. More than one image can appear on the same page so you have control how long each is visible and how it changes. You can also pause the display by moving the mouse over it so people will always have time to read anything of interest. All images uploaded are held in an Image management system allowing control over what has been used and maintains the images alt tags, titles and descriptions. The system supports all SEQ techniques allowing XML sitemaps, auto URL generation, and links to external statistics modules – Google, Bing, Statscounter etc. The auto URL feature is used on my site to add “folkestone-dover-ashford-canterbury” into the URL to localise the pages. This can be changed in an instant if I wish to target other areas. Pages can be opted-out from this feature if desired. You can control how the responsive settings work to customise the pages for tablets and smartphones using either portrait or landscape format.